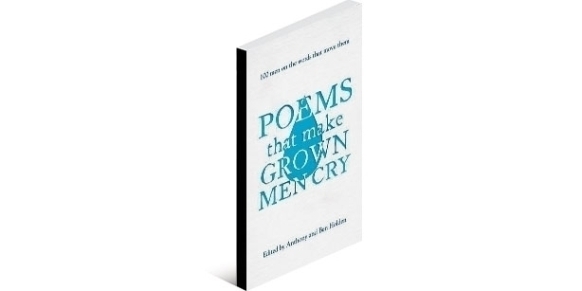 Since in my role of poet I want and ought to keep abreast of what’s currently considered good, memorable poetry, finally and rather belatedly I have got round to obtaining and attempting to absorb that trendy production: Poems That Make Grown Men Cry (2014). A hundred men, not alpha males but notably successful in their various fields, writing, scripting, film directing and the like (even science like Richard Dawkins!) were asked to contribute a poem with comment on how and why certain lines moved them, evoked their tears or a choked up reading. The project’s original idea had been a publication to generate funds for Amnesty International which was aware that once behind bars prisoners of conscience often take to verse. But along the way the book also aimed to break down a few gender stereotypes about men and emotions. The end product is a fascinating experiment which however finishes a very mixed bag that carries both outstanding and (to my mind) less impressive, even forgettable verse. Taken all together, the anthology is rather hard to assess and even represent. “Poetry” in this book can range from choices like James McManus’s of a prose extract (albeit poetic) from Finnegan’s Wake and Carl Bernstein’s of the nursery rhyme All the Pretty Horses, The latter is not really moving in itself but seems to have been admitted because Bernstein feels overcome by private memories of early fatherhood triggered by just reciting the words. Some of the poems are quite lengthy and others rather short – very much so in the case of Boris Akunin’s chosen Hokku (sic): “Dragonfly catcher/ Where today have you gone?”. Its seventeen syllables in the Japanese are said to be not just moving but to encapsulate the meaning and power of poetry itself and they have been inspiring Akunin’s fictional endeavours for years. Poems by Auden top the choice list followed by A.E. Housman, Thomas Hardy and Philip Larkin. One of Housman’s poems (Last Poems XL) was a choice shared by Richard Dawkins and former poet laureate Andrew Motion. I can’t help feeling that the Victorian poet’s tight rhymes and/or firm metres using octosyllabics or less, have a way of punching things home to the heart in a way stately, traditional iambic pentameter may not always manage to do. This struck me when I read Robert Louis Stevenson’s very felt Requiem, (chosen by novelist and Presidential speech writer, Thomas Buckley). Its simple beat and images with its sailor home from sea and hunter home from the hill, evokes something universal that is at once touching in its sense of finality and peace. SOME LAUGHTER AND THE TEARS TEST? For the most part, however, I found the ensemble less moving than quirky and even an interesting, rather special sign of our times whether as regards the types of poetry selected or the beliefs they conveyed – obviously a lot of the poems deal with attitudes to loss and death…. One or two choices seemed so off base they left me closer to laughter than tears, like the mentioned Akunin’s hokku and then Anish Kapoor’s choice of Adrienne Rich’s not unmeaningful but over-the-top Eastern War Time I, with statements Kappor weeps to like: “I’m a canal in Europe where bodies are floating…..I am a corpse dredged from a canal in Berlin…”. I could agree, as I am sure many would, with actor Hugh Bonneville in finding Rupert Brooke’s The Soldier moving (and even if you’re not English),,,, except that, however grand the feeling and the style, some of us happen to know that when he was dying Brooke wasn’t thinking about England as he imagined he would be, but love in Tahiti. It must be admitted nothing in the anthology moved me to tears as such (I even kept feeling how distant my own inner life must be from the Anglo-American one chiefly represented) but only to melancholy or gloomy thoughts. But that is what numbers of contributors more or less admitted was the case for themselves. Certainly some poems that got past the gate like D.H. Lawrence’s masterful and hauntingly strange Bavarian Gentians, chosen by oet Simon Armitage and about descent to the underworld, are just gloomy rather than tearful. The father and son editors Anthony and Ben Holden might have needed to take more time to track down men who really cried over their poem. Numbers of contributors admitted to a possible choke line or a few words that had been difficult for them to read out loud on occasions, but far fewer admitted to anything like the “breathing pure grief” which the last verse of Keith Douglas’s Canoe generates for Clive James, or that a part of Brian Patten’s Armada does for actor Paul Bettany which he says can make him wail. (Objectively Armada is a sad poem for a mourned parent and a lost childhood world). Apart from the mentioned Requiem poem, for myself one of the most moving poems in the collection is Wilfred Owen’s war poem Dulce et Decorum Est selected by the late Christopher Hitchens shortly before his death. Of course I knew it already and it could be called a fairly conventional choice in an anthology that to a striking degree eschews the traditional – most of the poems are modern and outside the canon – and bereft of almost all traditional belief and feeling about death and immortality too. There’s nothing here of Milton, Herbert, Donne or others, but a good deal in the spirit of what Philip Larkin does best for the outlook of total unbelief. Even the Auden poem Friday’s Child chosen by former Archbishop of Canterbury, Rowan Williams, unless read very carefully and well understood (it’s about both the execution of Dietrich Bonhoffer and Christ’s crucifixion) sounds more like mockery and denial of belief than any kind of affirmation. Quite why the Archbishop, indeed any Archbishop, would chose such a poem is a mystery, but reading this book is a reminder that indeed as the saying goes, “it takes all sorts to make a world”, because little here follows what one might expect. How could it possibly be that illustrator and screenwriter Mark Haddon would favour Derek Wallcott’s Midsummer Sonnet XL111 (it’s much longer than a conventional sonnet) which begins “Chicago’s avenues, as white as Poland/ A Blizzard of heavenly coke hushes the ghettoes” .Haddon is moved because Wallcott’ss list of urban details and objects (including “cars like dead horses”) is somehow moving just in itself. Presumably this is something an illustrator understands. Then there is Salman Rushdie’s choice of Auden’s In Memory of W.B. Yeats. This is a wonderfully sophisticated and witty poem except for its crazy, much criticized assertion “poetry makes nothing happen” ; but Rushdie, another of the anthology’s atheists and agnostics, finds overwhelming emotional force in its concluding words, (a contradiction of the nothing happens assertion), “In the prison of his days/teach the free man how to praise”…Oh well. Absolutely not moving as poetry, nor I think even distinguished as same, is Harold Pinter’s It is Here (for A) the choice of film director, Neil Labute. It is a mere ten line evocation of PInter’s first meeting with Antonia Fraser – the first line is “What sound is that?” and the last line is “Listen it is here”. I can’t understand why anyone would be moved by what merely registers or celebrates, and rather poorly in poetic terms (Ms Fraser seems like a disembodied je ne said quoi, not a person), the onset of by many accounts one of the nastiest adulteries (for its consequences) in the modern literary world. Since I am not especially familiar with the poetry of Emily Dickinson, I looked up just what it was she is supposed to be saying in novelist Douglas Kennedy’s choice of her After Great Pain which includes such as “- was it He that bore/and Yesterday – or centuries before”. Is the poet talking about her heart or Christ’s suffering or just what? It turns out nobody is sure and I am not surprised. Dickinson can be quite ambiguous, sometimes just disjointed in composition, but the fact you need to think what she’s saying at a point where she might be intending to pull at heart strings, makes you question this whole issue of poetry that makes to cry and/or be deeply moved. Dickinson (1830-1886) composed a relatively clear and by now almost canonical poetry, but she anticipates elements of modernism, and sufficient chunks of this grown men’s anthology enlarges upon the direction she takes when touching on ultimate themes. It beats a path deeper into a verse so ambiguous, gnomic, riddling or Japanese suggestive as with actor Colin Firth’s choice of Emily Zinnemann’s Regarding the Home of One’s Childhood One Could: that it prompts speculation about what is happening to the modern sensibility poetry does its part to form or reflect. It is my impression that Anglo-American society is so averse to deep emotion that it seeks to hide and suppress it as something foreign. In consequence, it may finish suddenly and unaccountably moved by the quirky and riddling where a maze of possible meanings both cloaks deep emotions and half releases them. The maze becomes a privileged site imagined as housing answers of sorts in the face of normally rejected, insoluble problems. Profundity lies not with affirmation and faith but rather with agnostic pointing in a world of often very random signs. A lot of the anthology is just melancholy whimsy (which is what I would consider a fair amount of English poetry to be) and of which the evidently popular Thomas Hardy is the great master if you like that kind of thing. SO WHAT IS POETRY TODAY? Faced with this would-be revealing, confessional anthology, some of us may still be left asking just what poetry is now supposed to be and where headed. Clearly this collection is nowhere near to the tears which, as opposed to those of regret or puzzlement, belong with a certain admiration before the sublime of which I recall Chateaubriand wrote somewhere. Rhapsodic, inspirational tears don’t appear. And if this sample of (largely) contemporary verse is anything to go by, it’s farewell to poetry that is, broadly speaking, didactic or inspirational/romantic in favour of something more like therapy or Zen realizations (the vaguer painterly sort rather than the instant flash variety born of specific meditational techniques). There is nothing here of the epic spirit, though something which recalls it is present in the long poems some contributors chose of Elizabeth Bishop, where it’s present ironically even eccentrically and therefore not very emotionally beyond feelings of a general regret. It cannot be stressed enough today, that poetry emerged in the prophetic function and thus traditionally has connection with religion, something even atheist poets like Shelley understood – his Ode to the West Wind clearly aims at vision, claims a prophetic role and the sublime. Modern poetry has abandoned not just faith but with it the sublime of the Romantics in favour of the humdrum world and the aforesaid whimsy. I feel like saying what most makes me want to cry in this collection is what it implies for poetry itself! Still, as I’ve said, the book marks a very interesting experiment. And I gather that what makes grown women cry is in preparation and will be revealed to the world in the northern spring of next year. Await further revelations and enjoy the contrast!